Family-owned businesses make up over eighty percent of Maine's businesses. In any five-year period nearly 40% of family owned businesses will pass the baton to the next generation. Given these statistics the IFOB has created several Next Generation Peer Advisory Groups. 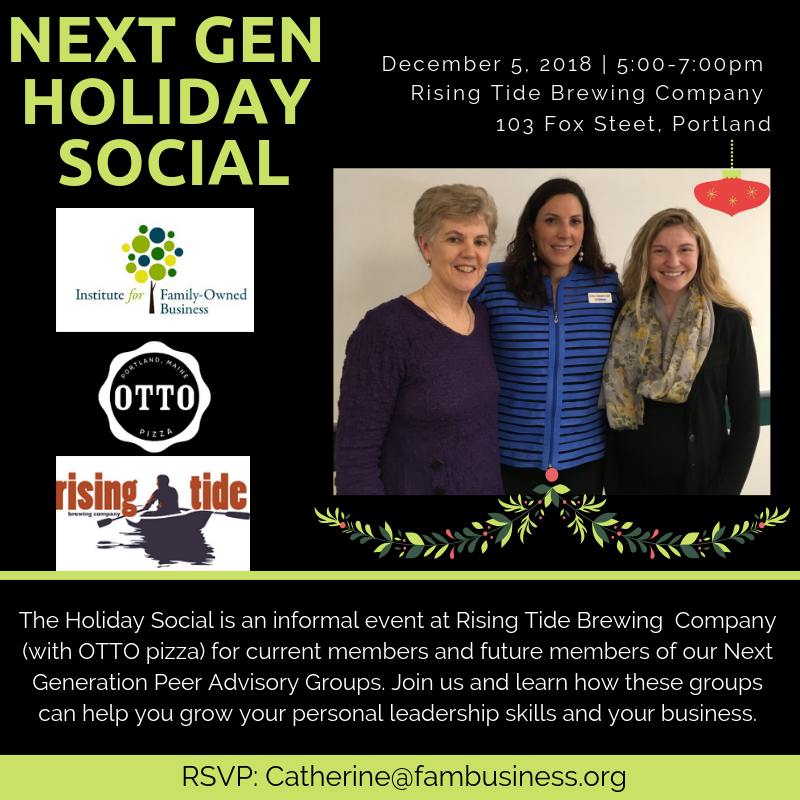 The Holiday Social is an informal event at the Rising Tide Brewing Company (with OTTO pizza) for current members and future members of these groups to mix and mingle. Join the IFOB executive director, Catherine Wygant Fossett, Janet Cross of Cole Cross Connections, LLC (who facilitates these groups) and fellow Next Geners to learn about these Next Gen groups and events. Janet created and facilitates these groups in order for members to learn and grow from each other. Sharing her perspective as a 3rd Generation in her family's business (Cole's Express), first working outside then inside, she consulted Maine family businesses and now she coaches the Next Generation. Peer advisory groups are small, confidential discussion groups that are facilitated. The group allows individuals to share experiences and learn from each other in a safe and open environment. These groups are for those actively working in a family business or who are interested in joining the family business, are IFOB members and in non-competing businesses. Ideally, only one member of a family will be in each peer group. "This group and the structure have helped me get more comfortable expressing my opinions, thoughts and ideas in the workplace with confidence." "At each meeting I walk away with at least one idea/concept to try!" We open these groups in December for the following year and will meet six times starting in January. Come Join us and learn about the value and benefits of joining these groups. Below is a breakdown of the groups based on levels of experience in a family business. NEXT GENERATION: Senior- This group is made up of Next Generation members who are working at the mid-management responsibility level in their company i.e. department managers/ area managers. NEXT GENERATION: Executive- Next Generation members who are working at the top management levels within their company i.e. Vice President, President, CEO, CFO levels.